I was critical of INnoVation’s TvP strategy previously because he kept doing the same thing and fail. He showed he had adapted his favorite TvP Reaper opening to the current metagame. Simple yet effective. Previously, INnoVation loved to go for 1-1-1 after Reaper expand. This shapes up to Widow Mine and Marine attack, which is not effective since Protoss has adapted to it. Other Terran players, for example Bomber and Polt, pull Scv out of gas and go for more barracks before tech up to factory and starport. There are other Reaper openings that go for an early engineering bay for upgrade before stim. INnoVation opts for an early stim for this build. Different players have different follow up variations of Reaper opening, but still shape up to the convergent point for a standard macro set up. They differ from when they pull Scv out of Refinery to get the mineral for command centre and also how many they pull out. The most clear cut way is to pull all three out from refinery when there is 50 gas while the Reaper is still building. This allows you to have max mineral and get the Reactor at the same time. For INnoVation’s build, he pulls one Scv out when he starts Reaper (his timing vary slightly according to games). There is exactly 50 gas for the Reactor once the Reaper completes. This is the same as pulling out all three Scvs when you have 50 gas. The timing to put Scv back to the refinery can be tricky as you need to test and refine the build. Thus, it is easier to remember when to put Scv back in by lining it up with other things in the build order. 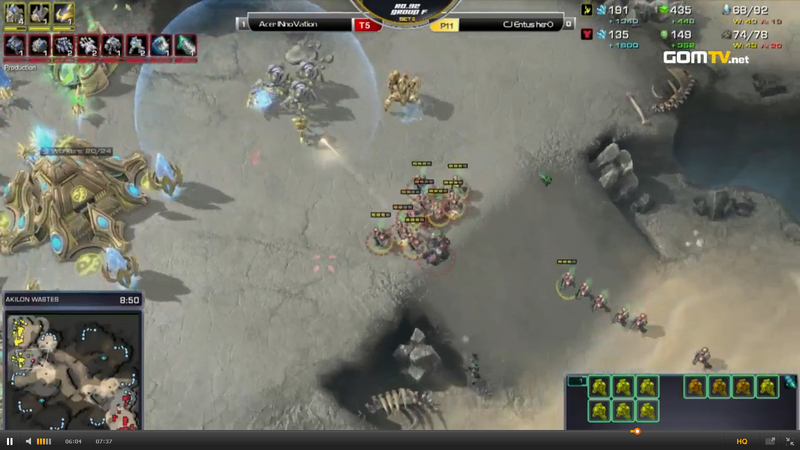 INnoVation built a second barracks before he puts the third Scv back in refinery. The key aspect of this build is the two timing attack. The first is at 6:30 with 1x Marauder and 8x Marine. The aim is to force out Photon Overcharge and not to deal any damage. I have already discussed how pivotal it is to force Photon Overcharge. INnoVation moves his Reaper to scout before his bio army walks to Protoss’ natural blindly. This is very important. First, you get to scout the tech path. 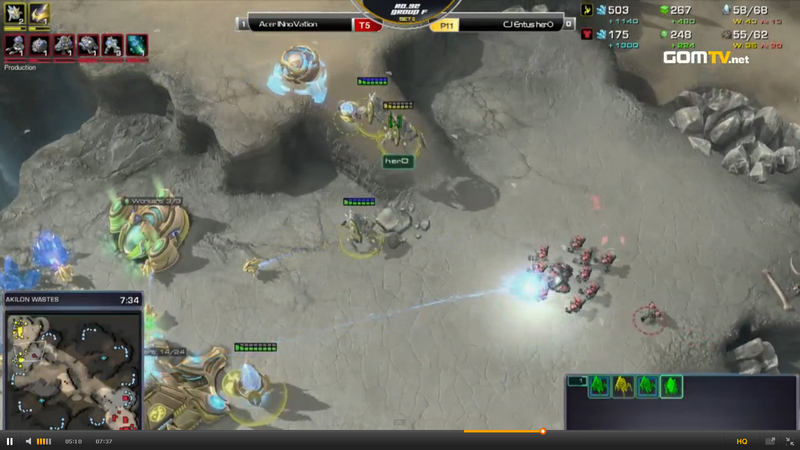 Second, you can see what units Protoss has. Then you can deduce if it is wise to attack with the bio army. If opponent has enough units to clear the bio army, just fall back. If he does not have enough, go up and force a Photon Overcharge. Do not try to run to the mineral line to kill Probes, because Protoss will activate Photon Overcharge to kill every units. This is then not called “force an Photon Overcharge” but just trade in a bad way. It is normal to loss a Marine or two. The one Marauder does not only have its basic functional use, but also works well to force a Photon Overcharge. This is because Protoss does not know if you have concussive shell. They are more likely to use Photon Overcharge if there is a Marauder in the mix. The first attack sets up for the second. The second is the damage dealer with stim at 8:30 – 8:45. It hits at the time before the 2x Medivac, and that is also before the first Colossus. Terran has a superior army with 1x Marauder and 10-15 Marines (depending on how many you lost) with stim. Without Photon Overcharge, it is difficult for Protoss not to take damage. INnoVation executed this against herO in WCS Korea GSL yesterday. I think herO saw the second attack coming and chrono-boosted out an Immortal instead of getting the usual Colossus. But it is still too difficult to hold. Great to see INnoVation is adapting to the metagame. From Protoss’ perspective, Reaper opening is hard to play against. They do not know if it is 1-1-1, which requires them to have cannon at the mineral line. Or is it a +1 timing? Or is it a stim timing? It is not easy to tell. “Adapt to the metagame” aka adapt to protoss’s 1 click ez mode defense? yep. I’d like to thank you and encourage to keep up these terran blogs! I am constantly juggeling between reaper FE into widow mine and this build. Both very solid openings. The only opening I consider on par with these 2 is Inno’s CC first build. But that build is way more vulnerable to early aggression and all-inns. The builds that you mentioned are indeed the top metagame builds now. Good to know them.